The Memorial House of Mustafa Kemal Ataturk, whose father came from Kodzadzik, opened in the village on Monday. President Gjorge Ivanov said Macedonia is proud to be called the native country of Ataturk’s father. “We remain consistent with the traditionally excellent cooperation with friendly Turkey. I believe Turks in Macedonia, as well as the thousands of emigrants of Macedonian descent in Turkey will continue to be our ambassadors of friendship and cooperation between the two nations”, said Ivanov. Culture Minister Elizabeta Kanceska-Milevska highlighted the significance of the memorial house in promoting the ideas of Ataturk, the father of modern Turkey. “The Memorial House is a strong argument in the promotion of understanding through culture. The facility includes a memorial house and the family home of the Ataturk family. It is a proof of the permanent friendship between Macedonia and Turkey”, added Kanceska-Milevska. Macedonian and Turkish Vice Premiers, Vladimir Pesevski and Emrullah Isler respectively, also addressed the event, stressing the enormous friendship between the two nations and states. The memorial house was constructed by the Ministry of Culture and Turkish Cooperation and Coordination Agency – TIKA. According to Macedonian and Turkish historians and archaeologists, Ataturk’s family had lived in Kodzadzik in the second half of the 19. century. By the end of the century, Ataturk’s father Ali Riza emigrated to Solun and married Zubeyde Hanım. Kemal Mustafa was born there and later enrolled at the Bitola Military High School. The Friendship, Equality and Peace Party, representing the Turkish minority in Western Thrace, Greece, will take part in Sunday’s European Parliament elections for the first time, contesting the polls with 38 candidates. Speaking to an Anadolu Agency reporter in Athens, the party’s chairman, Mustafa Ali Cavus, said Saturday that the party felt obliged to participate in elections ‘as a last resort,’ as he claimed the Greece government does not help solve the Turkish minority’s problems in many areas. “We will participate in the EU parliamentary elections to raise our voice in a democratic way,” Cavus said. The party’s vice president and a candidate for a seat in the European Parliament, Ozan Ahmetoglu, said that the elections are an opportunity to make the Turkish minority more visible. Ahmetoglu said the minority had many issues, which were compounded by economic difficulties, including a youth unemployment level that stands higher than the national rate. The European Union is holding parliamentary elections, which last four days through Sunday, when the majority of EU member states will hold their national vote. The Friendship, Equality and Peace Party was founded in 1991 to represent the interests of the Turkish minority in Western Thrace. Posted by Yilan in Trakya, Yunanistan. Why Sabiha Suleiman, a minority within a minority, never stood a chance. A few weeks before the much-touted European parliamentary elections, there were reports in the Greek press that a Muslim Roma activist by the name of Sabiha Suleiman would be a candidate, running with the left-of-centre main opposition party Syriza. Shockingly, Suleiman’s candidacy was over almost as soon as it was announced. What was intriguing was that a fellow Syriza candidate, who happens to be a vice president of the esteemed International Federation for Human Rights (FIDH) advocacy group, went on record to say that he personally had made every effort to ensure Sabiha Suleiman was struck off the ballot. Dimitris Christopoulos, the candidate in question, on paper, has an impeccable record in the field of progressive politics and human rights. Apart from his role in the FIDH, Christopoulos is a noted academic, specialising in minority rights. Moreover, he recently edited and co-authored a report examining the rise of ultra-right extremism, xenophobia and racism within the Greek state apparatus, on behalf of a think-tank directly linked to Germany’s leftist party Die Linke. What was the reasoning behind what can only be called an attack on Suleiman, who through her work in the Roma settlement of Drosero, in the northeastern region of Thrace, has produced measurable and commendable improvement in the lives of Muslim Roma children and women, through education and self-empowerment? Incidentally, Syriza placed labour activist Kostadinka Kuneva, a Bulgarian immigrant who was the victim of an acid attack because of her political views and actions, on the same European ballot. So striking Suleiman off could in no way be perceived as an attempt at assuaging possibly bigoted Greek voters. The reason Christopoulos initially gave for his statements and actions was that Suleiman’s candidacy would be a show of support for nationalism in an area of Greece which is plagued by it, to the detriment of those Greek Muslims who define themselves as ethnically Turkish. He even said that the Muslim minority in Thrace is a “unified Turkish thing”, and – initially – made no mention of those Muslims who define themselves as Roma or Pomak, a Slav-speaking ethnic group. The reason Christopoulos initially gave for his statements and actions was that Suleiman’s candidacy would be a show of support for nationalism in an area of Greece which is plagued by it, to the detriment of those Greek Muslims who define themselves as ethnically Turkish. Suleiman at the same time was smeared by those media supporting Syriza as someone who had received funding from the Greek Ministry of Foreign Affairs and nationalist circles. In response, Suleiman, who defines herself as a Greek Roma Muslim woman, said all this was happening because the Turkish consulate in Thrace was targeting her, as they wanted to ensure that the Muslim Roma were absorbed into the Turkish minority. Worryingly, there are reports that Suleiman has been physically attacked at least twice and that she receives threats almost every day. The mainstream media and the governing coalition parties seized the opportunity to accuse Syriza of catering to the interests of a foreign power. To say that things got messy and complicated would be an understatement. Before proceeding, let us set out some of the issues in question: self-identification, self-determination, gender, class, ethnicity, social class, citizenship, religion, memory, history, politics, diplomacy. What happens when all these combine to form an explosive mix? And what happens when one minority, itself the victim of discrimination, discriminates against another, less numerous minority? To get a sense of why things are the way they are in Greek Thrace, we have to travel back in time to 1923, after the collapse of the Ottoman Empire, when Greece and the then newly-formed Turkey signed the Lausanne peace treaty. It foresaw the forced relocation of nearly 2 million people, considered a progressive step at the time. The primary criterion for defining ethnicity was religion. Muslims living in Greece were relocated to Turkey and Christians living in Turkey to Greece. Two groups were spared: Those Greeks living in Istanbul as well as on two islands at the mouth of the Dardanelles; and the Muslim population of western Thrace which ethnically was comprised of Turks, Pomaks and Roma. One of the best accounts of what happened, combining exemplary research and a well-written narrative structure, is Bruce Clark’s Twice a Stranger. In Greece, those members of what the Lausanne Treaty called the “Muslim minority” during the Cold War were treated by the Greek state as a Turkish minority. Turkey was a NATO ally and the fear that the Slav-speaking Pomaks would side with Communist Bulgaria was greater. This changed when Greece and Turkey clashed over the issue of Cyprus, which Turkey invaded in 1974. Relations between Greece and Turkey have markedly improved since, but for those suffering the consequences of diplomacy, there is still a sense of being pawns in a game. But let us return to petty politics. In all the mayhem surrounding Suleiman, another candidacy passed comparatively unnoticed: that of Photini Tomai, head of the Greek Ministry of Foreign Affairs’ archives, who is running with the governing New Democracy party and who called Syriza’s stance towards Suleiman “treasonous”. Among Tomai’s accomplishments is a book on the Greeks who died at Auschwitz concentration camp, an official publication of the Greek Ministry of Foreign Affairs. So why mention this? It is less well known that the Roma were themselves the victims of the Nazi Holocaust. No Greek foreign ministry publication has been commissioned for those Greek Roma who were killed, Christian or Muslim. In any case, the Roma, Europe’s biggest minority, remain on the margins of society and discrimination against them is rampant. So which minority deserves more support? The regrettable situation for those Greek Muslims in Thrace who define themselves as ethnic Turks or ethnic Pomaks, in the face of the inadequacies of the Greek state, material and political, is a given. But Suleiman bears the additional burden of not being able to rely on support from a renascent Turkey, a country today part of the G20 group of developed nations. An openly pro-Turkey political party has been set up in Greek Thrace, whose discourse is similar to that of the Turkish state. Moreover, a key member of the Turkish Prime Minister Recep Tayyip Erdogan’s cabinet hails from Greek Thrace and reportedly takes a keen interest in the area. Interestingly, again because of the Lausanne Treaty, Greek Thrace is the only region in Europe where Sharia law applies. This has specific implications as to the rights of women. Suleiman, as a Muslim Roma woman, belongs to a minority within a minority within another minority. How do political institutions, how do societies, how do social groups, deal with such issues? Usually they do not. Ironically, Turkey itself abolished Sharia in 1926, adopting the Swiss civil code. Speaking of Switzerland, apart from being one of the most industrialised countries in the world on a per capita basis, it granted women the right to vote only in 1971. Would that imply Switzerland’s success is based on the limitations of the rights of women? Of course not. It is time we make proper correlations between cause and effect, especially towards those most vulnerable in our societies. Posted by Yilan in Turkey, Yunanistan. 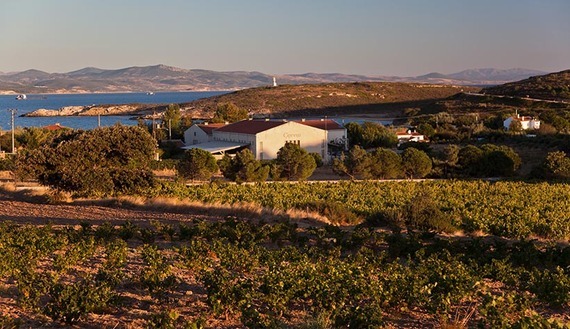 The Turkish island of Bozcaada is known for its vineyards, pictured here Sept. 4, 2013. 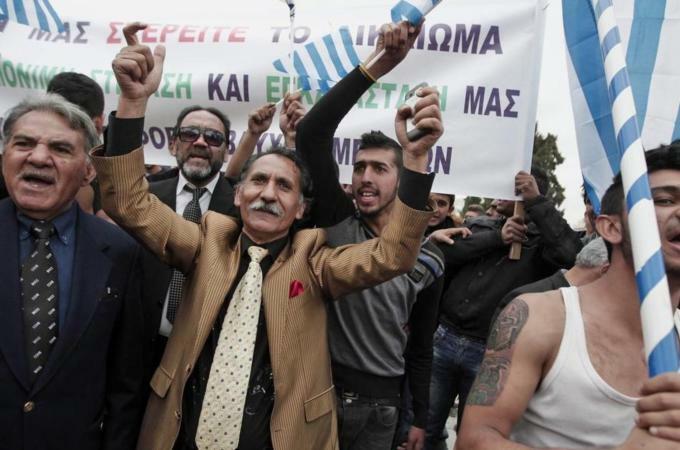 The Turkish media reported earlier this month that four Greek families had decided to leave Greece and (re)settle on the island of Gokceada, in Turkey’s northern Aegean region, encouraged by the reopening of a Greek primary school there. What was reported as a “small” story is actually of great significance given Turkey’s deep-rooted hostile policies toward its minorities. Summary Ankara’s softening minority policies have encouraged several Greek families to return to their native lands in Turkey, but a genuine reconciliation requires farther-reaching steps. The two islands mentioned in the reports — Gokceada and Bozcaada, or Imbros and Tenedos in Greek — had overwhelmingly Greek populations throughout their history until the 1960s, when Turkey’s policies drastically changed their demography. The number of ethnic Greeks has since dwindled to several hundred, while the number of Turks shot up to the tens of thousands. Over the decades, Turkey’s ethnic Greeks became scapegoats whenever the Turkish minorities in Cyprus or Greece suffered oppression or Turkey’s relations with Greece were strained. Populated heavily with Greeks, Gokceada and Bozcaada bore the brunt of Turkey’s antagonistic attitudes vis-à-vis its ethnic Greek citizens. In 2008, European Parliament rapporteur Andreas Gross penned a comprehensive report on the two islands’ historical and cultural fabric and detailed the plight of their former Greek inhabitants. One of the most striking sections documents how the Greeks were forced to leave. Gross wrote that the Greek islanders’ fate took a turn for the worse following the 1960 military coup in Turkey. The Greek schools on the islands were closed in 1964 amid Greek-Turkish ethnic strife in Cyprus, and the Greeks’ farmland was largely expropriated. The establishment of an “open prison” (agricultural prison) on Gokceada and the criminal acts the inmates committed against the Greek islanders drove many to emigrate. Gross said authorities failed to effectively intervene, but documents that emerged in later years indicate that criminal acts were in fact part of deliberate state policy. In the recording, the officer speaking, Col. Bulent Tuncay, head of the 1st Army’s Planning and Operations Department, is telling his colleagues that the acts committed against the Greeks were actual “state policy.” Gross asserted that the closure of Greek-language schools in 1964 was the primary factor that drove the Greek islanders to leave. In light of this background, the reopening of a Greek school in Gokceada after five decades, an insignificant development in itself, represents an important sign of change in a fundamental policy. Another important sign emerged on Dec. 13, 2013, when Turkish Foreign Minister Ahmet Davutoglu met with former Greek inhabitants of Gokceada during a visit to Athens. Paris Asanakis, head of the Imbros Association and a meeting participant, said Davutoglu extended an invitation to the 25,000 Gokceada Greeks scattered around the world to apply to regain their Turkish citizenship. Davutoglu’s visit and the drive to reopen Greek schools in Gokceada appears to have warmed Greek emigrants to the idea of returning to their native islands. Not all members of Turkey’s Greek minority, however, agree with Massavetas. Ethnic Greek journalist and Istanbul native Mihail Vasiliadis, for instance, argues that the “hate speech” targeting Greeks in Turkey today must first come to an end before a return could become possible. As I have noted in previous articles for Al-Monitor, the AKP government’s policy vis-à-vis non-Muslim minorities signals a break from the Kemalist militarist state tradition, but a comprehensive overhaul is yet to take place. It would be premature to say that Turkey has adopted policies that embrace non-Muslims and encourage their mass return. For instance, Prime Minister Recep Tayyip Erdogan often refers to Turkey’s various ethnic groups to emphasize the country’s heterogeneous fabric, but his list remains limited to such Muslim communities as Arabs, Circassians, Kurds and Turks. Nevertheless, the AKP government’s softening of Turkey’s historically hostile policies toward minorities and the return of several Greek families to the picturesque Aegean islands is inspiring hope for the future.